CAMPBELL Gunn, who died last month, was one of the senior statesmen of the Brighton community – a former municipal councillor, Rotarian, bowls enthusiast and farmer. AFTER last year’s record breaking winter season, the northern suburbs athletics club is hoping for even bigger things this year. Having exceeded 100 winter registrations for the first time last year, they are trying for 150 members this season. The Northern Suburbs Athletic Club is looking forward to even bigger things this year. BRIDGEWATER High home economics teacher and keen soccer player Georgie Roberts is enjoying her team’s victory at the World Masters Games at the end of last year.As a member of the Tassie Strikers, Tasmania’s over-35 women’s football team, she made it through to the nail-biting final. 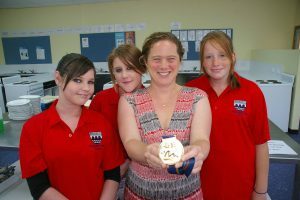 • Bridgewater High home economics teacher and World Masters gold medal winner Georgie Roberts with grade 8 students Skye Fitzpatrick, left, Carly Saunders and Kristen Swan. YET further signs of how the major projects in our community are now coming to fruition was the recent launch of the largest housing development for Brighton in the past 30 years (see story on our home page). A MAJOR housing development comprising 400 dwellings is underway at the former Brighton Army Camp site north of Hobart. The largest housing development in Brighton for 30 years, the project has been officially launched by Brighton Mayor Tony Foster. Brighton Council has approved the development of 328 lots to accommodate 400 new dwellings on the 62-hectare former Army Camp Estate at a value of about $120 million. 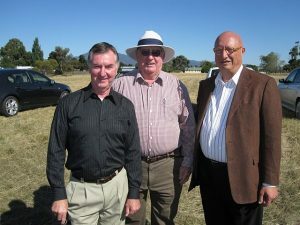 • At the development launch from left, Mayor Tony Foster with Deputy Mayor Geoff Taylor and Simon Touma, Director of Touma International Pty Ltd the owners of the site. THROUGHOUT the 20th century, Brighton was the centre of military training in Tasmania. Troops going to the Boer War and the First World War trained in paddocks near the Jordan River. ROADWAYS Pty Ltd’s decision to switch from LPG to natural gas at its asphalt manufacturing plant at Bridgewater was not a difficult one to make. Managing director Phil Sidney said when we looked at the company’s requirements and sat down and did the sums, the figures showed that natural gas was up to 60 per cent cheaper than LPG. 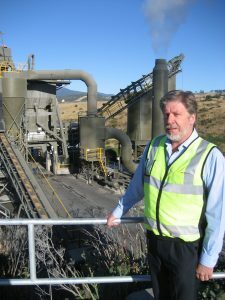 Roadways Pty Ltd managing director Phil Sidney at the company’s asphalt manufacturing plant at Bridgewater. SUNDAY March 7 was national cleanup Australia Day right across the country and iin our municipality it was no different. 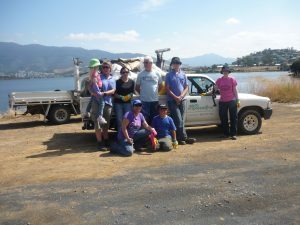 A small dedicated group cleaned an area from Cassidys Bay on the East Derwent highway towards Otago Bay. This group was predominately friends of local woman Stacey Turner who, along with Brent Lees, owns and operates a landscape and garden maintenance business called Earth Impressions. Clean Up Australia Day volunteers, from left Mackenzie-Rose Penwright, Stacey Turner, Larissa Murtagh, Ken Turner, Brent Lees, Natalie Turner, Vick and Ryan Liderth take a well-earned break.